Reading sheet music is not the most important thing in the world, nor is it essential to learn an instrument. But it can be extremely helpful, and if you are going to take your playing seriously I would highly recommend that you try to learn. 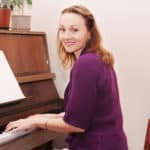 I will in this article break everything you need to know down and guide you through the basics of reading sheet music. But first, let’s find out why you should learn. This will motivate you not to give up and help you progress. Why Should You Learn How to Read Sheet Music? Do you remember when you learned to read when you were little? I know I do. It was really hard work, going through every single letter, trying to write it nicely, remember exactly what it looks like and the different sounds connected to it. For some kids, it takes a few years before they can read fluently, and the struggle is real. But would you say that it’s worth it? Most people would think that the advantage of being able to read is invaluable. Why is it that we need to be able to read? Well, the reason I ask is that these are the very same reasons for why it’s good to be able to read sheet music. If you’re able to read, you can pick up a book and know exactly what is said in it, even though nobody has told you about it before. It’s the same with sheet music, if you learn to read it, you’ll be able to play music that you’ve never heard before, but you can still play it exactly as it’s supposed to sound. Ever tried to memorize a poem or a speech? It’s very helpful to read the text as you memorize it, instead of repeating after somebody else, and it’s the same with music. Reading along with the sheet music as you learn a piece will help you to memorize it and will be a good reminder of many different things. Think back to a music lesson in school or a choir rehearsal you once attended. The teacher hands out papers with song lyrics on them, and everybody is able to sing along using the right words. This is applicable to sheet music as well because if you play with other people, you all need to be on the same page, literally. Sure, it’s possible to play in a band without reading music, but if you want to play classical music, it’s going to be almost impossible to learn without this helpful tool. In a group setting, you’ll also be able to read and see what the other musicians play, which makes it easier to understand the piece as a whole, rather than just separate parts. So even though it’s absolutely possible to play an instrument without reading sheet music, there is no reason not to learn it. It does take a lot of work, and it might take you a few years to learn to read it fluently, but it’s absolutely worth it! Don’t get discouraged if you feel like you don’t get it in the beginning. It’s like learning a new language. At first, you might just know a few useful phrases and words, but the more you practice and find new connections, the easier it will be to unlock new knowledge. The two most important things that are written down using sheet music is rhythm and tone. The rhythm is different from the beat, or the pulse if you will. Let’s listen to how this works and try it out. Listen to Queen’s ‘We Will Rock You’. The characteristic ‘stomp, stomp, clap’ is an example of an easy rhythm. But if you take away the second stomp, and simply do ‘stomp…..clap…..stomp….clap’ you are suddenly just marking the beat. The beat is what we usually would clap along with to a song, whereas the rhythm can have a million variations. The rhythm is depending on the steady beat, and if the beat changes tempo, the rhythm will also do that. The tempo is often called BPM, which stands for beats per minute. A clock has, for example, 60 BPM, since it has got 60 seconds in a minute. Sometimes your sheet music will say, for example, 120 BPM, and then you know that it’s quite fast, double the tempo that a clock has. But you don’t have to guess the tempo, you can use a metronome, which you can set to tick at a certain BPM. There are also phone apps with the same function. So does this mean that you always have to obey when you see that a piece is supposed to be played in a certain tempo? Not at all! 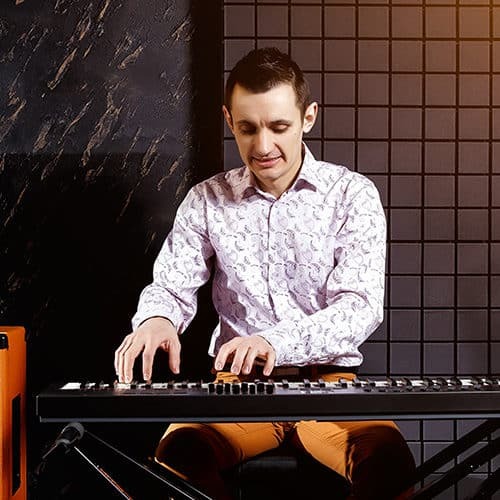 It’s helpful to know what tempo the composer had in mind when writing the music, but at the end of the day, it’s up to you what tempo you want to play it in. Especially when you learn the piece you need to slow it down so that you can learn it properly, and then you can speed up eventually until you’re able to play it in your preferred tempo. Let’s get back to ‘We Will Rock You’. Try stomping and clapping only on the beat, remember, ‘stomp…..clap…..stomp….clap’. Keep doing this throughout the first verse. Now, try starting the song again, but this time I want you to clap using the rhythm of the words. ‘Bud-dy you’re a boy, make a big noise, play-ing in the street gon-na be a big man some-day’. Notice how when they sing ‘We will, we will’, the rhythm and the beat are the same. This illustrates how the rhythm is depending on the tempo. If the tempo would be faster, you would need to clap the lyrics faster as well. This might sound ridiculously simple, but it’s good to know the difference between the rhythm and the tempo, which not everybody does. This knowledge is essential when we now move on to learning how to write rhythm. Remember how I said the rhythm is depending on the beat? This is something that you need to keep in mind when you read music and play. The very first thing you need to do when trying to figure out a rhythm is to look at the time signature, which shows how many beats there is in a bar, and what kind of beats we’re talking about. I circled 4/4 so you know what you’re looking at. 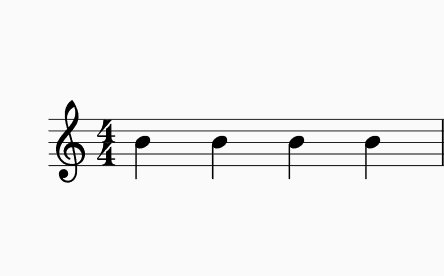 The top 4 stands for how many notes that fit in a bar. A bar is the space between two vertical lines and is used to make it easier for us to read the music. So we can fit four here… But four of what? This is where the bottom number comes in. In this case, it says four, meaning a quarter note. You’ll find that most music is built on quarter notes. 4/4 can also be written as a C, and 2/4 like a C with a line through it. Legend has it that the C used to be a full circle, symbolizing the holy trinity, something the monks or whoever it was that came up with it thought was a fitting, complete symbol for the complete, full 4/4 time signature, but eventually it turned into a C.
As you can see from this example, we only have three quarter notes in a bar. If you want to hear the difference between a song in 4/4 and 3/4, listen first to ‘Let it be’, by The Beatles and then to ‘One Last Dance’ by Us the Duo. When you listen to ‘Let it be’, count 1, 2, 3, 4 and when you listen to ‘One Last Dance’, count 1, 2, 3. It is possible to write a 3/4 as if it was a 4/4, but it will just be really weird, and the same for the opposite and for any time signature. Even though time signatures might seem tricky, they are there to make the music easier to read. 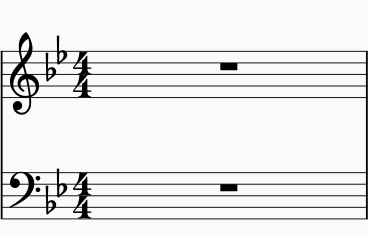 The tempo might regulate which time signature the music is written in. If the song feels like a 3/4 but mostly consists of eight notes, it’s generally easier to call it a 6/8, and so on. Music contains a lot of math, but don’t worry, most often you don’t need to count to more than eight! You might have noticed that there are a few different kinds of notes that look slightly different. This has to do with the note value. 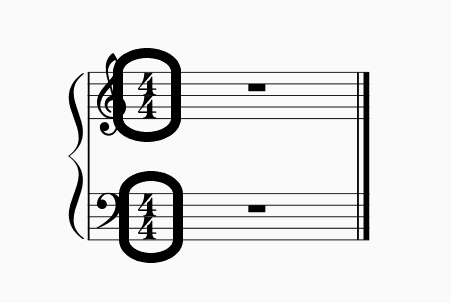 The note value is a fancy word for the duration, or the length, of a note. Some notes are long, some are short, and we need to be able to tell how long or short they should be. Let’s start with the longest note and make them shorter and shorter. The notes as measured by how many beats long they are. This is the reason why I wanted you to really know how to find the beat in a song and how it’s different from the rhythm. Don’t focus on which line it is on, we’ll get to that later. For now, we’re just looking at the design of the note. Notice that it doesn’t have a note stem, it’s just a round ring. Next up is the half note. 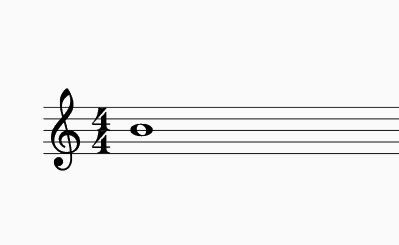 You guessed it, it’s half a 4/4 bar, meaning that it lasts for 2 quarter notes. It’s half as long as the whole note, but you might already have guessed that! Notice how these ones are just like the whole note except for one thing: they have stems. But they’re still a round, empty ring. The next note value we’re finally going to take a look at is the famous quarter note. It’s half the value of a half note. You might notice a trend here, for every shorter note value, we’re splitting the bigger one in half. Do you see what’s different about them? Yes, they’re not empty anymore, but black. Black note with just a basic stem, that’s the good old quarter note! If you split a quarter note in half, you’ll get an eight note. You can fit 8 eight notes in a 4/4 bar. Easy math, since they are half as long as the quarter note, we can fit double as many. Look closely at the last eight note. As you can see, the only difference between it and a quarter note is that it has a single flag attached to the stem. But why are the other eight notes beamed together? Simply because it’s easier to read this way. If you have two eight notes after each other, you will most often want to beam them together to make it easier to read. There are exceptions, but for now, that’s enough information. We’ll get to that later. Let’s keep splitting! Half an eight note equals one sixteenth note. You guessed it, you can fit 16 sixteenth notes in a 4/4 bar! It looks like this+ an extra single one. As you can see, we’ve only added an extra flag to the single sixteenth note, and the beamed ones get an extra line to distinguish them from the eight notes. This pattern continues further with thirty-second notes (3 flags), sixty-fourth notes (4 flags) and so on, but you will probably not ever use notes as short as that. But what if you want to write a note that is somewhere in between, for example, a half note and a whole note. Let’s use this example to find out how to write a note that is three beats long. This is when we use dots to prolong a note. If you put a dot after a note (dots over or under have another meaning that has nothing to do with the rhythm) it makes it longer. Specifically, it makes the note longer by half its value. So a half note, which is two beats, will be 2×1,5=3 beats. 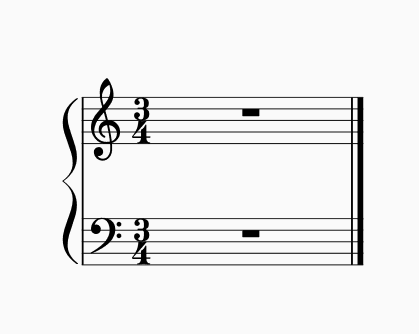 The quarter notes that are tied are in effect the same as a half note, but we wouldn’t be able to write a half note there since there is no space left in the bar for it. Which of the pictures do you think is easier to read? The answer is the first picture. The reason for this is that it’s much easier to see where the beats in the bar are located and when in the bar the notes are played. In the first example, it’s easy to find the beats. The first beat is on the first quarter note, the second on the eight note after that. The third beat is easy to spot and will come in the middle of the tied note. With the second example, it’s not that easy to see where the beats come, because the quarter note in the middle of the bar comes between the second and third beat. We can’t always play, sometimes we need to pause, either to let somebody else play or because that’s what the rhythm demands. Rests can be as important as the notes and should be respected. Every note value that we previously looked at has a corresponding rest that is as long as it. You will probably not encounter triplets for a while if you’re a total beginner, but it can be good to know that they exist. Triplets are three notes that are played over the same time as two of those notes would normally take. This means that they will feel like three notes that are sort of rushing forward in a swingy kind of manner. If you want to hear an example of a song using triplets, listen to the Star Wars Theme. 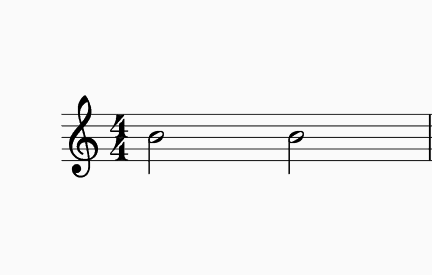 The first three notes are triplets. You can also hear a good example in Bon Jovi’s ‘Living on a Prayer’. Listen for ‘We’ll give it a shot’ and ‘You live for the fight when it’s all that you’ve got’. Now that we know how to read the rhythm, it’s time to learn the notes. We use something called the staff for finding out what notes we use. In other words, the five lines that we write the music notes on. The very first thing you will see is the clef. There are a few different clefs, but the two most common ones, used for piano and most other instruments, are the treble clef and the bass clef. You may wonder what the clefs do. Let me tell you. They show where the notes are! Or at least give you reference points. Look at the treble clef. This clef is also called a G-clef because it shows where the note G is. 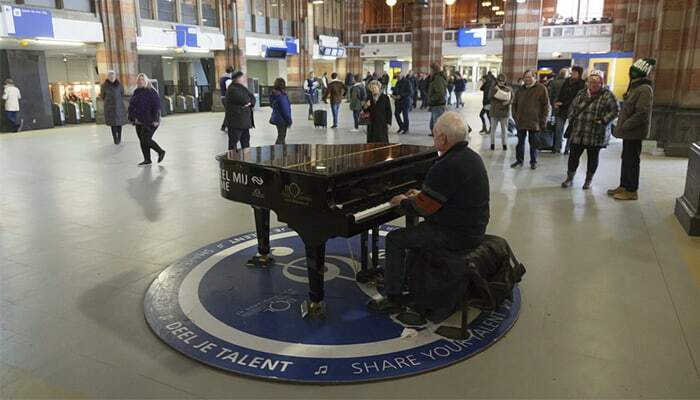 This is not any G, but the G in the middle octave of the piano. So if you find middle C, you’ll just go five notes to the right and that’s the G the treble clef points out. G is located at the second line counting from the bottom, where you start drawing the treble clef. Using this information, it’s easy to count up or down to figure out what note is on a line or in between. 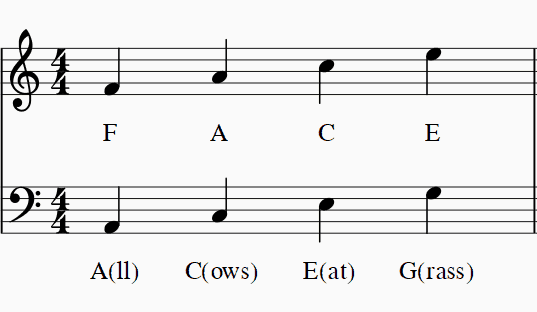 The notes are called A, B, C, D, E, F and G, and after G comes A. There is one note on every line and one note in between all the lines. Now, look at the bass clef. This clef is also called the F clef and shows you where the F that is five notes down from middle C is. It’s in between the dots! Before I give you some tips on how to quickly find the notes, let’s talk about why we use different clefs. We use different clefs to make it easier to read the music. We want to be able to read low notes and high notes as easy as possible. Look at the first bar. Even though it might look like it’s two different notes, it’s actually the same note, G written in different clefs. Which one do you think is easier to read? Instead of writing 6 extra lines to get down to where we need to be, it’s easier to just move everything down. This is why the bass clef is used for the left hand in piano when it plays in the lower octaves and for instruments that mainly play in a low register. Now, look at the second bar. Here too I’ve written the very same note in the different clefs. Don’t you agree that it’s much easier to figure out the note name when using the treble clef? Two or three extra lines above or below the staff are ok and manageable, but the clefs are there to make sure that you don’t need ten extra lines. It might seem complicated, but they’re really just there to make it easier to read the music. The notes are written on the staff going up or down. High notes are high up and low notes further down, makes sense, right? If a note is written beneath the middle line, the stem will point up, and if it’s written above the middle line the stem will point down. This is simply so that the stems don’t stick out too far. The notes on the middle line are optional, you can choose if you want the stem to point up or down. There are a few ways to remember the notes, but you’ll find that it’s only in the beginning you’ll need to use them, soon you will know exactly where to find all the notes on the staff if you practice. Let’s start with the treble clef. For remembering the notes in between the lines, remember FACE. 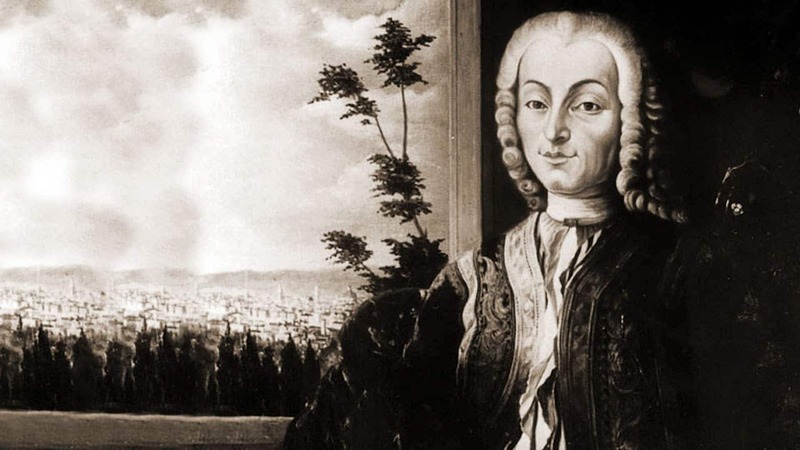 When it comes to the bass clef, remember ACEG. Wait, that’s not a word! Easier to remember is ‘All Cows Eat Grass’. Here is a picture so you know what I mean! There are ways to remember the notes on the lines too, but I think it’s good not to make it too easy for yourself. Only knowing the notes in between the lines will force you to count using the note alphabet to find out the notes on the lines and speed up the learning process. 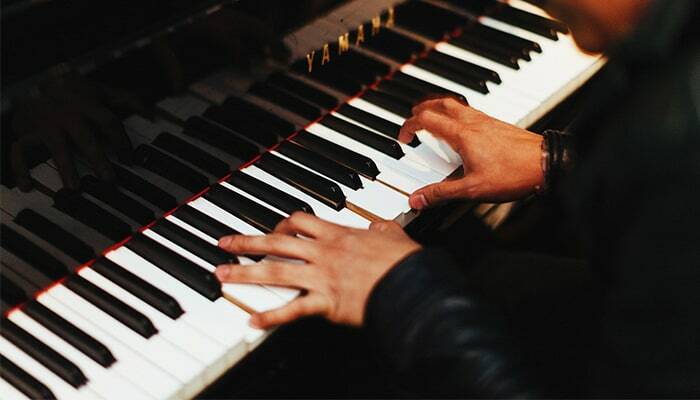 If you look at a piano, we’ve only learned to read the notes that are located on the white keys. Let’s learn how to write the black notes. We use flats, sharps, and naturals to move a note half a step up or down. Let’s go through them one by one! Look at the first bar. We’ve used a flat to push E down a semitone and it’s now called E-flat, often written as Eb. If you want to know the difference between them and hear it, listen to Beethoven’s Für Elise where the beginning is just shifting between E and Eb. Now, look at the first note in the second bar. This is a C-sharp, we’ve used it to push C up a semitone, and now it’s a C-sharp, or a C#, as we write it. Just like when writing a normal text, we need to spell correctly when we write sheet music. As you might have figured out, a C# and a Db are the same note. And really all the notes can be spelled differently but sound the same. This is when we need to think about the context. You’ll find that in a song with a lot of sharps, it will be unusual to use flats and the other way around. 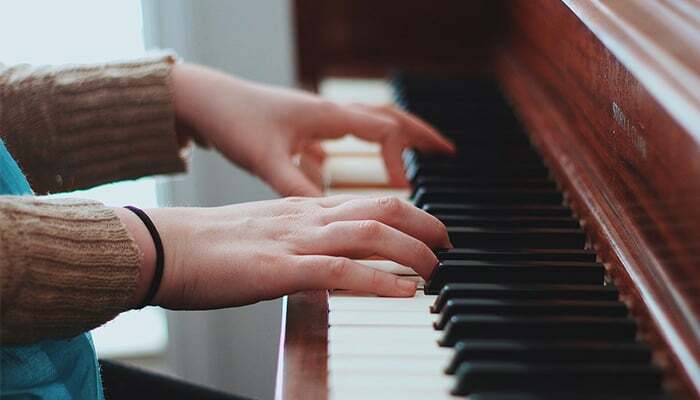 The scale, the chords and other things will determine if that black key you’re playing is called A# or Bb, even if they sound and look exactly the same on the piano. ‘Spelling’ correctly has a lot to do with making the music easier to read. Accidentals, as the sharps and flats are called when they appear in the middle of the music like in the pictures, in front of a note, last the bar out. But if you want it to stop before the bar is finished, you need to use a natural. That’s what has happened to the very last note in the picture. The C# has become a normal C because I put a natural in front of it. The natural cancels out any accidentals with regard to that particular note. A natural can also be used if a note is sharp or flat because of the key signature, which I will explain now. One of the great benefits of music being so mathematical is that we can take a song and move it to any other key and it will still sound the same, just higher or lower, but it’s still exactly the same song. In order to move music about and keep the same distance, or intervals as we call them, between the notes in the scale, we need to use sharps and flats. The only two keys that don’t have any sharps or flats are C major and A minor. To illustrate this, let’s say that we want to play a C major scale. Then, we want to move it a whole step down (that is, two semitones, or two keys on the piano if that helps you visualize it). 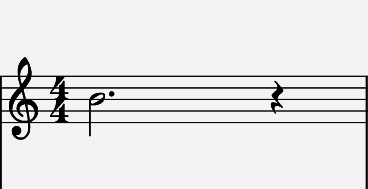 The first note we land on will be Bb, so for that one, we have to use a flat. We came from above and are going down, and that’s how we know that it’s a Bb and not an A#, even if they’re found on the same key. The next note is taking D, the second note in the C major scale, one tone down, which will make it C. Nothing weird so far. Then we’re doing the same with the third note in the scale, E. Turns into D. Quite straightforward, right? But now we reach F, and we want to move it down a whole step as well. We’ve moved all the keys the same interval down so far, so this one has to follow that pattern. The thing with moving F down a whole tone is that you will land on Eb. The rest of the notes in the scale will be easy to move down a whole step without altering with a sharp or a flat. We can conclude that there were two notes we had to use flats for, Bb and Eb. And they will probably remain like that for the whole song unless differently indicated somewhere. Instead of having to put a flat in front of every single B and E in the song, we change the key to Bb, which has two flats. These flats are written at the beginning of every line so that we know that they are valid the entire song. As you can see, the first flat is located on B and the second on E. These are their set places, and there could be up to six flats, all on their set note in the correct order. The same principle works for sharps. To remember what notes are sharp you can remember: Father Charles Goes Down And Ends Battle. F, as in Father, is the first note turning sharp, C is the second and so on. So if you, for example, see four sharps, you’ll be able to quickly say to yourself ‘Father Charles Goes Down’, and know that it’s F, C, G, and D that are sharp in that song. This is a quicker way of learning than looking at the lines trying to figure out where the sharps are because sometimes it’s not easy to see straight away if you’re not very familiar with them. If you want to do the same thing with a song using flats, you just say the Father Charles thing backward: ‘Battle Ends And Down Goes Charles Father’. To find out what the key is called can also be useful. For flats, look at the second to last flat. What note is it on? That’s the name of the key. 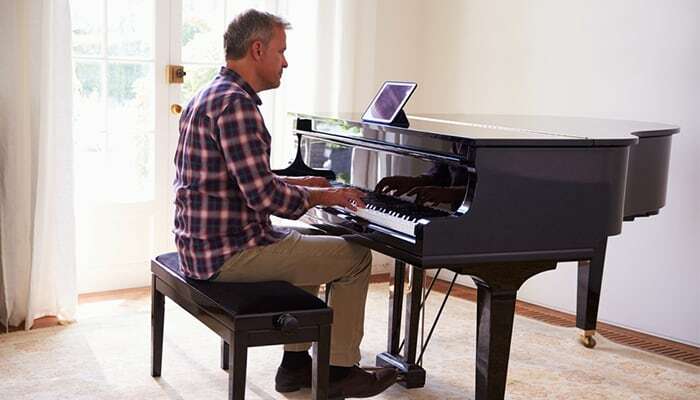 The only time you can’t do this is when you only have one flat, but you’ll probably be able to memorize that the key with one flat is F major (or D minor, but we’ll get to that in a minute). For sharps, you look at the last sharp and simply go to the next semitone up. So if you have one sharp, which will always be on F#, the key is G major (or E minor). 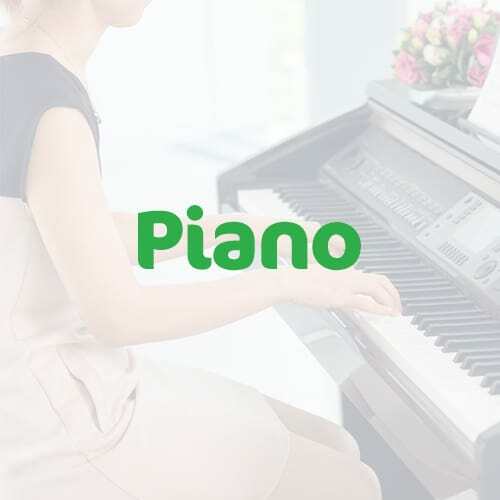 Another way that you most often can use to tell what key a song is in is to look at the first and last note or chord in the song, which is very often the same note as the key the song is written in. Every major key, which you just learned how to find, has a cousin. If the major key is the happy cousin, its cousin, the minor key is the sad one. These two cousins are pretty similar, because they use the same set of notes to create music, more or less. To find out what is the parallel key to a major key, you need to go down a minor third. For example, in C major, you would go down, counting three keys, to A. A minor. To find out the parallel key to Bb major, go down a minor third and you’ll land on G. G minor. If you instead want to figure out the parallel key to a minor key, you need to do the same thing backward and count three up. Whether a song uses sharps or flats has nothing to do with major or minor, there are just as many major keys using flats as there are using sharps. So if you see a song with two sharps, for example, you can’t know for sure if the key is D major or B minor until you’ve taken a closer look at the music or have heard it. Just like you can’t read a book fluently as soon as you’ve learned all the individual letters in the alphabet, you won’t be able to read sheet music fluently just because you’ve read this article. Do you remember the very first book you learned to read? I remember mine, it was about a boy named Thor, and I knew that book by heart. This was because I had read it so many times, and the words and sentences were really short. When I picked up that book, I would look at the words as if I was reading, even though I already knew exactly what it said. Without my knowledge, my brain probably worked really hard every time I read that book to remember and to connect my existing knowledge to new things. It would notice that the word ‘and’, was said when I read it, and connect it to the written version, and the same with all the other words until I would be able to recognize them in another context. This happens when you read music too. In the beginning, you will probably just learn to play a song and not really be needing the sheet music, but even though you know a song by heart, following along in the sheet music as you play it can make all the difference in the world. There are also other ways to learn, for example clapping rhythms while a metronome ticks the beat or play games that help you remember where the notes are. The iPad app ‘Piano Maestro’ is also an excellent way to learn how to read music. I hope that you found this guide helpful and feel like you have a basic understanding of how to read sheet music.